Optical Wireless Communications for Broadband Global Internet Connectivity Majumdar Arun K.
Auteur : Majumdar Arun K.
Optical Wireless Communications for Broadband Global Internet Connectivity provides a comprehensive overview for readers who require information about the fundamental science behind optical wireless communications, as well as up-to-date advanced knowledge of the state-of-the-art technologies available today. The book is a useful resource for scientists, researchers, engineers and students interested in understanding optical wireless communications system for global channels. 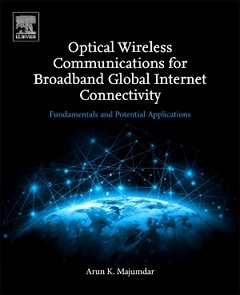 The reader benefits from the knowledge of how related technologies of optical wireless communications can be integrated into achieving worldwide Internet connectivity. Professor Arun K. Majumdar is a research scientist and a former university professor. In the past he has worked in optical communications and research industries for over 28 years, was the Director of Research at LCResearch, Inc. in California. He served as a full Professor at the University of Colorado for five years, and served as a Visiting Professor at both NIST and at the Brno University of Technology in the Czech Republic. Professor Majumdar has published over 395 articles in international scientific peer-reviewed journals, has written over 25 technical reports, and is the author/editor of two other books. He is a member of IEEE, OSA, and SPIE. He received his Ph.D. in Electrical Engineering from the University of California, Irvine.